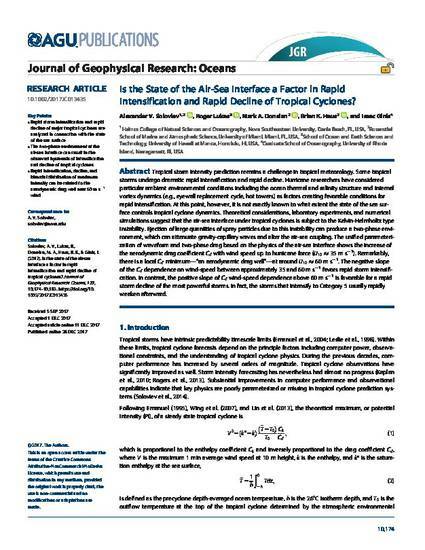 Is the State of the Air-Sea Interface a Factor in Rapid Intensification and Rapid Decline of Tropical Cyclones? Tropical storm intensity prediction remains a challenge in tropical meteorology. Some tropical storms undergo dramatic rapid intensification and rapid decline. Hurricane researchers have considered particular ambient environmental conditions including the ocean thermal and salinity structure and internal vortex dynamics (e.g., eyewall replacement cycle, hot towers) as factors creating favorable conditions for rapid intensification. At this point, however, it is not exactly known to what extent the state of the sea surface controls tropical cyclone dynamics. Theoretical considerations, laboratory experiments, and numerical simulations suggest that the air-sea interface under tropical cyclones is subject to the Kelvin-Helmholtz type instability. Ejection of large quantities of spray particles due to this instability can produce a two-phase environment, which can attenuate gravity-capillary waves and alter the air-sea coupling. The unified parameterization of waveform and two-phase drag based on the physics of the air-sea interface shows the increase of the aerodynamic drag coefficient with wind speed up to hurricane force ( m s−1). Remarkably, there is a local minimum—“an aerodynamic drag well”—at around m s−1. The negative slope of the dependence on wind-speed between approximately 35 and 60 m s−1favors rapid storm intensification. In contrast, the positive slope of wind-speed dependence above 60 m s−1 is favorable for a rapid storm decline of the most powerful storms. In fact, the storms that intensify to Category 5 usually rapidly weaken afterward. ©2017. The Authors. This is an open access article under the terms of the Creative Commons Attribution-NonCommercial-NoDerivs License, which permits use and distribution in any medium, provided the original work is properly cited, the use is non-commercial and no modifications or adaptations are made.